It has been a busy summer in terms of music festivals this year. For me, it started with Make Musik Sthlm on Sweden’s national day. Since then I have been to Heineken Open’er in Gdynia, Stockholm Music and Arts and, most recently, Way Out West in Göteborg. Way Out West (WoW) is a pretty big festival in terms of line-up but the site itself is relatively small (which is good), with the 3 main stages at Slottsskogen. There are also a number of smaller venues in the city. Friday was by far the biggest day with bands such as First Aid Kit, Feist, Blur, Bon Iver, Wilco, Ane Brun. Other bands at WoW this weekend included Florence & the Machine, the Black Keys, Kraftwerk just to name a few. I went to WoW on my own but it was fairly easy to meet nice people at the festival. I ended spending a lot of time with a couchsurfer from Turkey who happened to have similar tastes in music. It was nice to hang around with her over the weekend. I have been lucky enough to meet a bunch of nice people through this blog. If you have read some of my previous posts, you will know that I am a big fan of Jenny’s travel blog. When I told Jenny that I would be traveling to her city, she kindly offered to meet up for fika (now, for those of you who have not heard of fika before, here is the introduction on the Wikipedia entry: “Fika is a social institution in Sweden; it means having a break, most often a coffeebreak, with one’s colleagues, friends, date, or family. The word “fika” can serve as both a verb and a noun. Swedes consider having a coffee an important part of the culture”). Back to Jenny! She travels quite a lot and I consider myself lucky that she was in town during my visit. Actually, she had just got back from a trip to Poland (where she visited cities that I also visited in the summer: Gdansk, Sopot, Gdynia) and Berlin (go read her blog for details!). Jenny had strategically chose a meeting point which was on my way from downtown to the festival area: Haga. 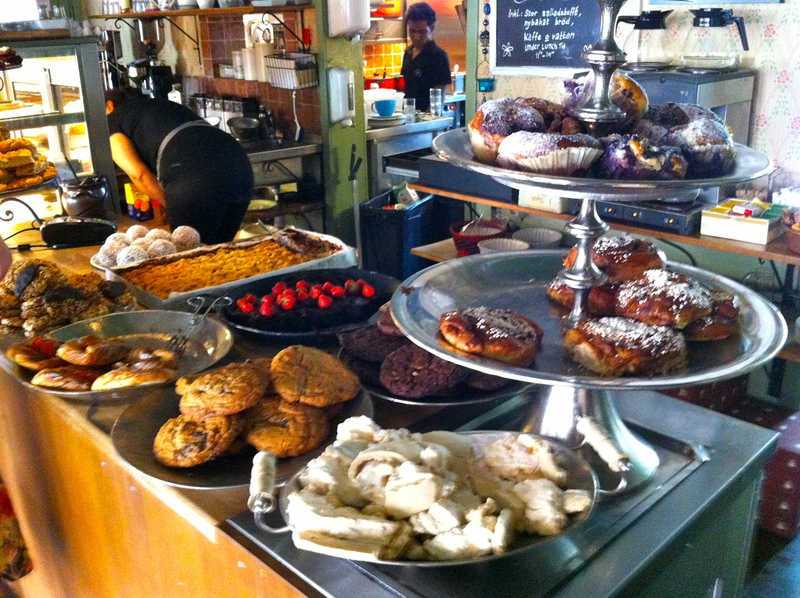 As it turns out, Haga is also fika central in Göteborg. 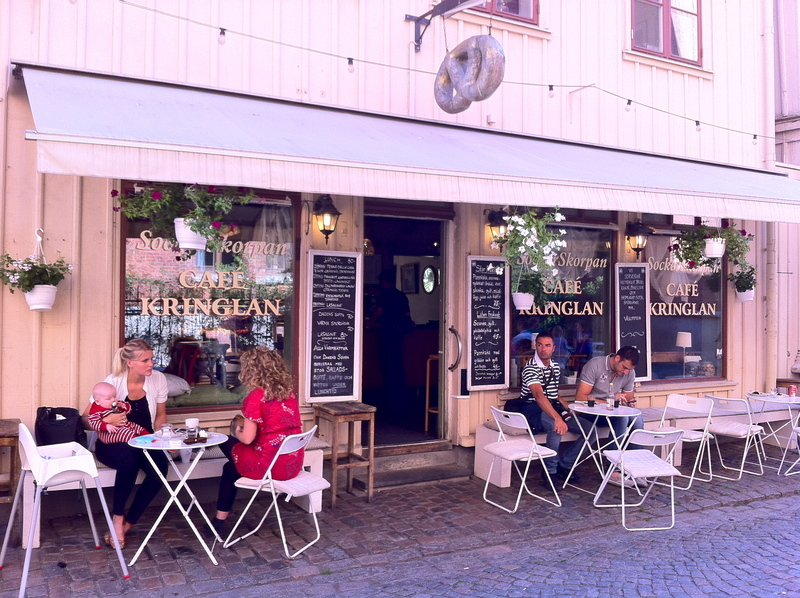 After a walk along the pedestrian street full of cafés, we decided to stop at Café Kringlan. The café had been recommended by one of Jenny’s friends. That was an excellent recommendation. The café is strategically located halfway through the street, making it an excellent spot for people watching. 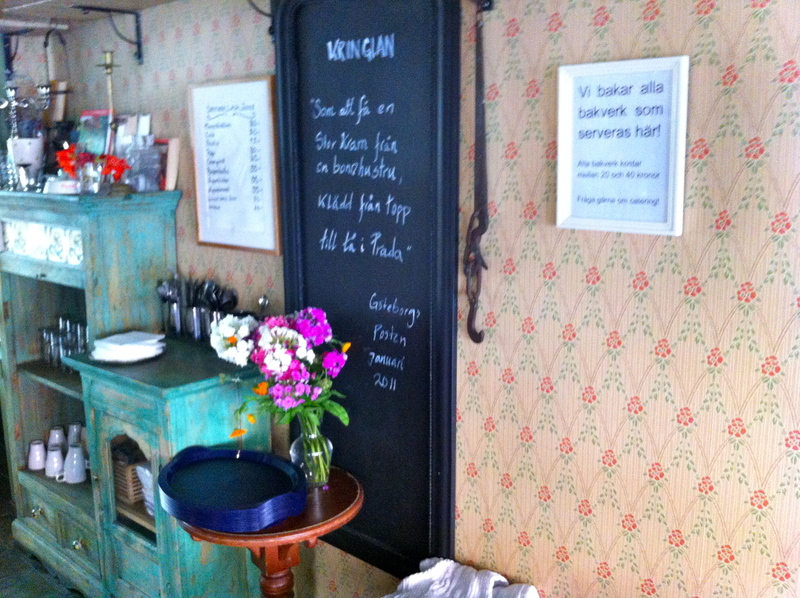 More importantly, Café Kringlan offers amazing cakes which are all baked on site. It took me some time to make up my mind and although I had decided to go with something somewhat healthy, when came my turn to order the only words that came out of my mouth were: “chocolate cake”. 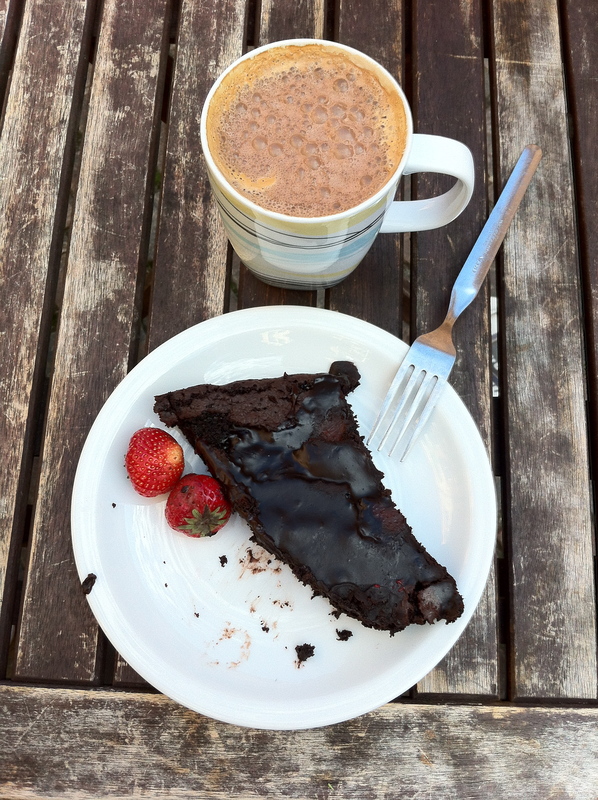 Which I had with a moccacino…. and strawberries. I felt guilty for a few seconds when I realized that Jenny wasn’t having any cake but that guilt feeling didn’t last very long and it was all about pleasure as soon as I had the first bite of that cake! Café Kringlan is a very nice café with beautiful rooms inside, although on this beautiful summer day everybody was sitting outside. You can find Haga right off Järntorget in Göteborg. On the other side of Järntorget is another street (Andra Långgatan) which also looks promising for the café culture, starting with Dirty Records café, among others. Yet another good reason to visit Göteborg again sooner than later. Now, I will need to coordinate the timing of my visit with Jenny to make sure she is in town at that time. That looks like awesome cake. I doubt I can find cake and coffee like that here.